How to select my AirVantage login server URL (eu.airvantage.net or na.airvantage.net)? How can I modify the communication frequency? Can I change the variable and the system name? Why my smartphone stops to send the GPS location? 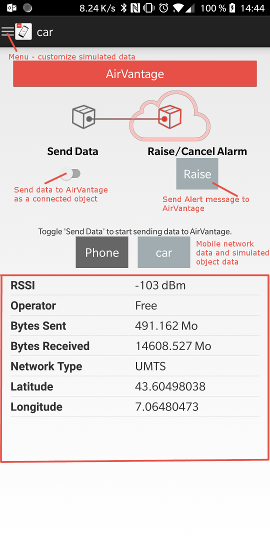 AV Phone is a mobile application, it sends data to AirVantage as a simulated object. 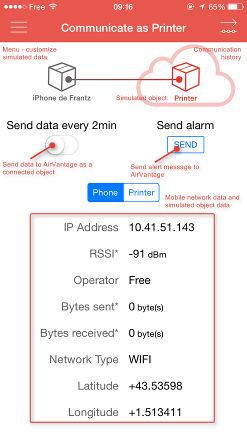 By default, the app simulates a connected printer that sends mobile network data and simulated printing operations data to AirVantage periodically. AV Phone is available in 2 versions: Android and iOS, they are available for free download from the respective app store. Toggle on the “Send Data…” switch to start sending data! To stop sending data, simply toggle the “Send data…” switch to the off state. The data is now waiting for you in your AirVantage account! Check it out! Turn on the “Send data…” switch to start sending data from your phone to AirVantage periodically. You can leave the app running in the background, it will continue sending data. To stop sending data, toggle the “Send data…” switch to the off state, or log out from the application. The iOS version always starts by sending communications without data (Data point = 0). It will start sending the application data after a delay of max 2 minutes. 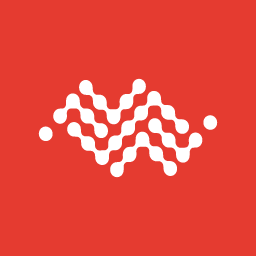 Please do not modify or delete your phone’s system from the AirVantage web portal, this may impact the mobile app operation (as the app may no longer be able to identify the system on the AirVantage account). You can send an alert message to AirVantage by clicking on the “Send Alarm” switch. This alert is not associated with any data threshold, it is for illustrating the data push capability only. The iOS and Android version allow the users to store multiple simulated object profiles in the app, and activate anyone of it at any time. In the object menu edition, you can resync all objects to AirVantage. The Android version source code can be accessed on github here under the MIT License (see License.md file in the repository). This is the web address (URL) that you use to log in to your AirVantage account with a web browser. If you do not recall this information, refer to the welcome email message from Sierra Wireless upon the AirVantage account creation. For the iOS version, click on “Settings” of your phone. Look for “AVPhone” in the app list, and select the “Frequency” options : 1, 2, or 5 minutes. If sending data about Printer suits the most of the use cases, you may want to customize the data label. The configure tab allows you to change these labels automatically. You can see the data you can use by clicking on the Application Details in Monitor > System > System Details view > Application Details bubble. You can choose how to simulate each data by selecting up, down or string to respectively increment, decrease the value or not change it. Only the labels are changed, the data id (or data path) are not modified. If you want to get it using the AirVantage API, nothing is required to be changed. You can choice how to simulate each data by selecting increase indefinitely, decrease to zero, random or None. For the decrease to zero simulation, the value is reset to initial value when it reaches 0. You can choice also the data path for the value. The label and the data path can be changed. You can change the system name on AirVantage to fit your business case. You mustn’t put the application in background mode. In this case, the smartphone stops the application in order to save power. Be aware battery consumption is high in this case. If your app is frozen, you can close the app (on an iOS device, double tap the “Home” button to see the list of background apps, and remove AV Phone from this list) and re-open it again). For the Android version, if you receive an invalid user when you try to send data, you can try to resync all the objects to AirVantage (Menu > Edit > Resync All). If you have any feedback or question, please use the “Feedback” button in the AirVantage web portal to contact us. Hope you enjoy using the AV Phone! Happy IoT building!